How do I find out about the retailer bundle? Simply message us through Kickstarter using the link at the top of the page, and we'll put you in touch with our trade team who can run through what's available and how to pledge! How do I tell you what I want for my pledge and where to send it? 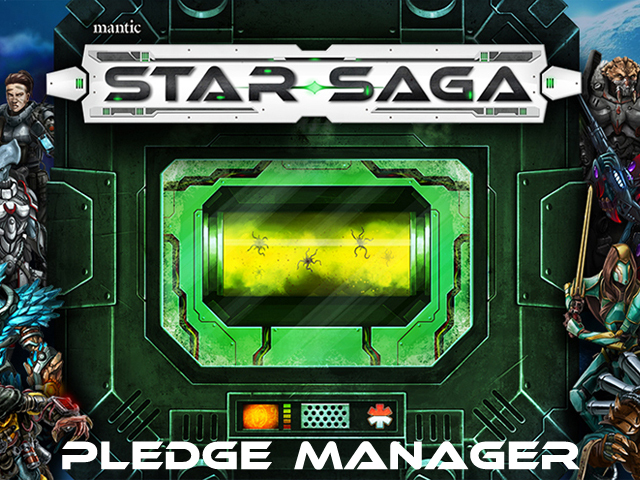 Within a few weeks of the Kickstarter closing we will send you an invitation via email to the Star Saga pledge manager. On the pledge manager you will fill out your address and contact details, which pledge level you want and what add-ons you wanted (if any). You can even choose more items than you initially pledged for on the Kickstarter and pay the difference on the pledge manager, including any additional shipping charges that may be incurred. Do I need to fill out the pledge manager? Yes. You must fill out the pledge manager. If you do not fill out the pledge manager we will not have your address, and you will not get your pledge level during the Wave 1 shipment. We will not be able to guarantee that we will have enough stock to supply your full pledge. You will receive a confirmation email when you successfully check out from the pledge manager, and can check your order by clicking ‘My Orders’ on the pledge manager. If you do not receive a confirmation email and/or there are no orders on your account then you have not successfully completed the pledge manager. When will payment be taken? Can I change my pledge? If you pledge on this Kickstarter, payment will be taken at 11:59 GMT Saturday October 21, the same time the project ends. If payment is unsuccessful you will have 14 days to correct your payment details before Kickstarter cancels your pledge. Because payment is not taken until the campaign closes, you may change your pledge amount as many times as you like during the campaign. Just click ‘Manage my Pledge’ and you can make alterations. When will my pledge ship? Where will my package be shipped from? What shipping method will be used? What value will be declared on the package? We estimate that Wave 1 shipping will begin in October 2017. Wave 1 packages will be sent from the UK using local post, such as Royal Mail. The customs form on your package will represent our costs for providing the pledge. The cost of shipping will not be included in the value marked on the customs form. The package will also be marked as a gift. Please check with your local customs office for any charges that may apply to your shipment as you will be responsible for these. What language is the game available in during fulfilment of this Kickstarter? Star Saga is only available in English during the Kickstarter. What size are the miniatures? What material are the miniatures made from? Do the miniatures come painted? The miniatures are 30mm scale, with the average adult character standing approximately 1.3 inches tall. The miniatures are single-piece and no assembly is required. They are made from a highly detailed, durable plastic. The material is a type of PVC commonly used in our games such as The Walking Dead: All Out War, as well as games by other manufacturers such as Wrath of Kings and more. This plastic allows us to have a high level of detail while keeping the dynamic poses required for such a fast-paced game, and of course making them as affordable as you would expect from Mantic. Note that this material is not the harder PVC commonly known as “restic”, and is not sprued “hard plastic” (polystyrene). Your miniatures do not come painted – the miniatures shown in the photography are for promotional purposes only. Miniatures are supplied in coloured plastic - a different colour for each of Mercenaries, Bosses and Minions. What does Kickstarter Exclusive mean? Here at Mantic we don't want to release figures through Kickstarter that will then penalize customers who miss out on the campaign. However, we do want to keep our Kickstarter exclusives a little bit special. Therefore, although our Kickstarter exclusives will never be sold at retail, they may be available later via the Mantic Points Scheme on our website, or offered as promotional figures at conventions or other events. Can I get multiple pledge levels? You can select as many as you like - just increase your pledge as appropriate. For example, if you're at the Core Pledge reward ($100) and want a second one, just pledge a total of $200 - you can tell us that this is what you want at the end through the campaign manager. If you're at an Early Bird level, then any additional reward levels of the same type will be at the same cost, so if your first one is costing you $90, then the second one will cost the same price! Shipping is to be paid for each reward level, as each one needs to be sent as a separate package due to shipping restrictions. For example, if you want two copies of the Core Pledge reward, you would have to pay the shipping twice. How do I find out about the retailer bundle? How do I tell you what I want for my pledge and where to send it? Do I need to fill out the pledge manager? When will payment be taken? Can I change my pledge? When will my pledge ship? Where will my package be shipped from? What shipping method will be used? What value will be declared on the package? What language is the game available in during fulfilment of this Kickstarter? What size are the miniatures? What material are the miniatures made from? Do the miniatures come painted? What does Kickstarter Exclusive mean? Can I get multiple pledge levels? I want to know when my reward is shipping. I am having trouble filling out my survey. I would like to make a change to my pledge. I would like help with preorders. I have a issue with my pledge finances. I have a question for the project creator. I have a question not listed here. I want a refund for my initial campaign pledge. I have a question about BackerKit.